(Natural News) It’s pretty easy to protect yourself from dangers that you can see. Take sharp objects, for instance: If you’re handling a knife or any object that can injure a person, it’s only right that you take appropriate measures to avoid accidents from happening. Protecting yourself from dangers that you can’t see, on the other hand, is a little trickier. For one, there are a lot of things people can’t see that can cause real danger – pathogenic microorganisms, particulate pollutants, and toxic chemicals. Fortunately, there is a comprehensive body of knowledge that identifies the risk factors for most of these unseen dangers, as well as individual treatment and preventive measures. Of these “unseen” dangers, however, radio frequency (RF) radiation from mobile phones is, by far, the most controversial. A scientific review from the National Toxicology Program of the U.S. Department of Health and Human Services has concluded that there is “clear evidence” that RF radiation from mobile phones could lead to cancer – despite its lack of coverage in mainstream media outlets. 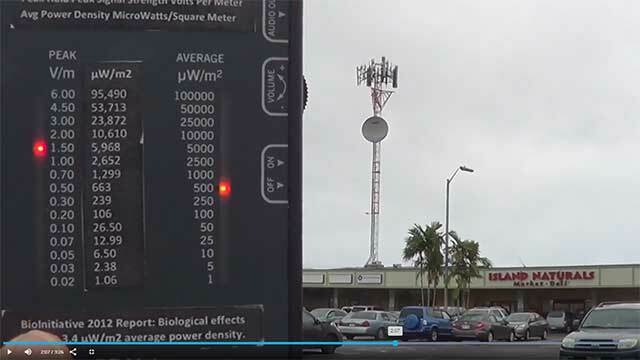 In his video, Neil from EMF Safety Zone captured a scene from what he called the “weird wireless world.” In a shopping district in Hawaii – where holistic health stores are located – on top of a health food store sits a cellular tower which emits an average power density of 1,000 μW/m2 of RF radiation and has a peak signal strength of 1.5 V/m when measured from the ground. “People are working in this area, all to the sides and underneath the cellphone tower,” Neil said. He also acknowledges that this setup happens in many places and not just in Hawaii. Despite soothsayer claims that there is no definitive proof that mobile radiation is harmful, it doesn’t mean that it’s safe either. As we function in this “weird wireless world,” here are some steps to minimize RF radiation and maintain your health and well-being. Try to avoid body contact with your phone and computer, if possible. Practice “earthing,” where a person puts his bare feet on the ground and absorbs the Earth’s negatively-charged electrons. Turn off your Wi-Fi if you’re not using it. Remove smart meters – these can pulse EMF radiation up to 190,000 times a day. Take a hike – Going for a “technology detox” and indulging in nature is a great way to reduce EMF exposure. Make it a habit to switch off the TV or your phone and read a book instead. The feature is part of EMF Safety Zone’s video on the dangers of RF exposure, which can be viewed on this link.